¶ 3 Leave a comment on paragraph 3 0 Most of the songs on John Wesley Harding share several distinct traits. First, the scenes painted by the lyrics seem to reflect a times long past. The characters speak in archaic terms (“fairest damsel“, for example), and the well-known figures (“Tom Paine“) that appear are often from early American history. Second, he seems to have consciously tried to be as concise and to-the-point as possible. Gone are the loud and long “eight pages of vomit” songs such as Like a Rolling Stone. Instead, each song reads almost like a terse Emily Dickinson poem. The music is similarly constrained, most songs accompanied only by harmonica, guitar, bass, and drum.This strategy works with As I Went Out One Morning. Although short and succinct, the lyrics still manage to tell an interesting story and pack a significant wallop. ¶ 4 Leave a comment on paragraph 4 0 So what is this song about anyway? It seems to me this is another of Dylan’s songs that warn of the possible loss of personal liberty due to a control-freak lover, similar to It Ain’t Me, Babe. The “fairest damsel“, in this case, doesn’t take his “hand”, but rather “take[s] him by the arm” as if to guide him in the direction she’s going, which doesn’t seem to be the great of places, given that she is “in chains”. This image reminds me of a line from Don’t Think Twice, It’s Alright: “I gave her my heart/she wanted my soul”. The narrator hero wants nothing of this action and, just in the nick of time, up runs “Tom Paine” – the embodiment of liberty – to help save him from a fate of chains and woe. ¶ 5 Leave a comment on paragraph 5 0 Another possible interpretation, which has been noted by many Dylan commentators, is that the “fairest damsel” is a symbol for America, an America that is hell-bent on manipulating and limiting its citizen’s freedom (Dylan, as usual is way out in front on this issue, thirty-odd years ahead of the Tea Party). This interpretation is supported at least somewhat by the fact that the song was written during the upheaval in the US during the late sixties, a time of great skepticism about the US government’s intentions. ¶ 7 Leave a comment on paragraph 7 0 Those of us that grew-up in the United States know who Tom Paine was. But everybody’s reading this is not from the US, so a little explaining might be in order. The longish description of Thomas Paine can be found on Wikipedia. 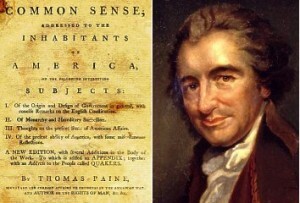 The short explanation is that Paine wrote a short pamphlet, “Common Sense”, that succinctly described why he thought the colonies should break free from the British monarchy, that it made little sense for them to be ruled by a distant, malevolent monarchy. It was widely read and is credited for playing a significant role in inspiring the American Revolution. Lolly toodum, toodum, lolly toodum day. I know you want to get married, and you know that you’re too young. ¶ 11 Leave a comment on paragraph 11 0 And here is Auden’s poem. ¶ 28 Leave a comment on paragraph 28 0 And the deep river ran on. ¶ 29 Leave a comment on paragraph 29 0 Dylan has only played the song once live, during the 1974 tour with The Band. Not really worth seeking out. ¶ 30 Leave a comment on paragraph 30 0 Mira Billotte did a cover for the soundtrack to I’m Not There. She sticks close to the original.